Mr. Coben writes stand-alone novels, which are awesome, but he also writes an ongoing mystery series that is totally one of my all-time favourites. So when I heard about a YA spinoff, I was…well…concerned. It’s not that I doubted Harlan Coben’s talent (I swear that I didn’t Mr. Coben, DON’T HATE ME) but I just didn’t think it would be possible to have the same kind of vibe in YA as there is in Adult Fiction. so I got over myself and bought Shelter. Haha! Shelter stars Mickey Bolitar, Myron’s nephew, a fifteen-year-old kid whose father (Myron’s brother) died in a car crash and mother is in drug rehab. Not a happy situation, obviously. Myron takes Mickey in, but their relationship is strained, at best. Mickey has a hard time adjusting to his new school, as most teens would, but when his girlfriend goes missing, Mickey discovers that he has his uncle’s penchant for private investigating and he gets right on investigating what went down. There are a lot of similarities between Mickey and Myron’s characters, most notably their voices and senses of humour, but Mickey is certainly a younger, more vulnerable character. The stakes aren’t quite as high as they are in the Myron books, which is good…you know, because Shelter is YA and not Adult Fiction, and it had my attention from start to finish. In fact, I read it in one sitting. The mystery component is layered and dense, and there were enough bits of misdirection to keep me on my toes. So basically, what I’m saying, is that Harlan Coben is a freaking genius because he managed to not only have the same witty-yet-thriller-y vibe that pops up in his previous novels, but he’s probably been able to hook an entirely new and much younger audience with Mickey. Well done, Mr. Coben. Well done. 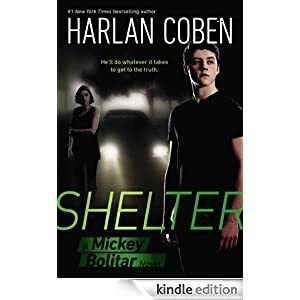 If you haven’t read any of Harlan Coben’s books, you totally should, and Shelter would be a great intro. I’m not sure if the Mickey series will have the same depth of supporting characters that make the Myron books so incredible, but here’s hoping!